This was made by Hephaestus at first. Though Ares had a input on the design and abilities. to give these weapons to his Uncle Hades. Of course this was a means to make a sort of truce. Allows the weilder to summon souls of the dead. 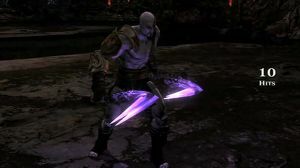 Using the magic stored within the chains, Hades can pull out the soul of his enemy. (Only Hades can do that, but people can resist their soul being ripped from their body). They can be throwed forward and retracted back because of the chains on the weapon. Can not be destroyed. They can be taken, but not destoyed. They have very powerful magic inside.